Yesterday we held our 4th town hall focusing on crime prevention and reduction. The targeted neighbourhoods were those around St. James grade school, Mic Mac Park and Windsor Regional Hospital. The meeting was held at the John McGivney Children's Centre. We had approximately 15-20 residents in attendance. Lee Tome from Windsor Fire and Rescue presented on crime prevention strategies. 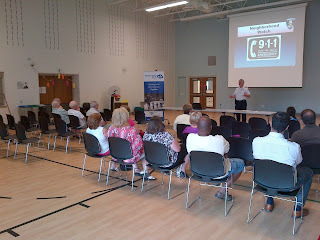 9-1-1 Dispatch also presented along with the Safety Village who discussed neighbourhood watch. All questions form residents were answered and many were educated on different techniques to prevent and reduce crime in their neighbourhood. We hope to establish a neighbourhood watch following this town hall in the above mentioned neighbourhoods. I want to personally thank Lorraine Oloya from our team and Chantalle Faubert from the Safety Village who delivered flyers and helped organize the event. Attempted Theft and Robbery on Felix Ave. and Connaught Ave. Please see the email below that I received from a west-end resident. Two incidents occurred recently on Felix Ave. and Connaught Ave. Please be on the lookout and contact Windsor Police if you see anything suspicious. "I...just learned of your website and want to report a break in...Recently, someone broke into my mom's shed by prying the lock and popping the screws. My dogs barked, so I let them out on the screened in porch and I think that scared them away since nothing was taken. It appeared that they were in the process of taking the wheel barrow since it had been moved. I reported this to the police. A neighbour across the street reported to me that his wheel barrow was taken from behind his shed on the same night." The Bridgeview neighbourhood watch team had informed me that there were two car break-ins on the 1000 block of Partington recently. Please be on the lookout and spread the word. Windsor Police were notified. Please see an email I received below regarding a new Sandwich Town Farmers Market and Flea Market. This sounds promising and very positive for the area. "Grand Opening next Fri. ,Sat, Sun 9am till 3pm. Sandwich & Mill SW corner behind the new Barrel House Bar,Wally's Baits & Billies Place. Bill Voakes has been trying for twenty years to get all permits and approvals. If anyone has Flea Market wares to sell or knows a farmer or great gardner with extra produce call Bill at 519-990-1055 for a booth. Thanks Fabio Bill could use all the help getting this going he can get. He will be there for at least ten years." On Tuesday July 30th, we are assisting the Safety Village in hosting a neighbourhood watch town hall at the John McGivney Children's Centre located at 3945 Matchette Rd. The town hall will begin at 6:30pm. In attendance will be Windsor Fire and Rescue Services, Windsor Police, 911 Dispatch, the Safety Village and others to give brief presentations and answer any questions related to crime prevention and reduction. Those interested in forming a neighbourhood watch on their block are welcome to sign up with the Safety Village and get all the info you need there. The neighbourhoods where we delivered flyers include those around Windsor Regional Hospital, St. James grade school and Mic Mac Park. However, this town hall is open to all west-end residents interested in neighbourhood watch. Great news. Bridgeview Library has just added a newcomer outreach service. Please see the email I received below. "Hi, Fabio, Summer's greetings! Hope everything goes very well. I would like to share the news with you and your patrons, New Canadians' Centre of Excellence Inc has expanded LSP(library settlement program) service to Bridgeview Library, I will be at Bridgeview Library every Tuesday from 10am-6pm, any newcomers in this area please come to visit Bridgeview Library or contact me on 519-990-7661. Have a wonderful summer and keep posted! Thank you." See the email I received below from a west-end resident concerning a stolen bike and other things. Please spread the word and keep an eye out when you can. Thanks. We are in need of volunteers to help deliver flyers in the neighbourhoods around St. James grade school and Windsor Regional Hospital. We are hosting a town hall on July 30th focusing on neighbourhood watch. Windsor Police, Windsor Fire and Rescue, The Safety Village and Barry Horrobin from Windsor Police, among others, will give presentations and/or answer questions or concerns from residents. We hope to assist in establishing a few neighbourhood watches in that area and continue our work in developing an environment where residents are sharing relevant information regarding crime with each other and with Windsor Police. If you can help, please email me at fabiocostante@gmail.com. We will be out this Saturday and Sunday delivering flyers. Thanks! Recently a friend of mine sent me a link of a local company (Fahrhall) giving back to the community. They helped a fellow west-ender in need. If you have facebook, check out the link below. This is a great example of good corporate citizenship. Our West End - Please Read! Our website is up! Check it out at www.ourwestend.org. Let us know what you think and please do not hesitate to provide us with any feedback. If you can spare a few minutes, I ask you to please read my post below and get in touch with me should you have any questions, concerns or comments. I really want to hear from you. There will be major upgrades at Paterson Park along with handicap curb cuts on eight residential streets in the west end. On Tuesday July 9th at 2:30 Ambassador Baptist Church will be doing a large flyer distribution for their upcoming VBS to reach the west end children. If you have some time that you would like to donate PLEASE come out and support a great cause. If you have others that may be interested please pass this email on! Let’s rally around these precious people bringing support and unity. Let’s all show up and surprise them and show just how we do care about the west end. Love is action!!! Thanks for your time & hope to see you out! & students you can use this towards your community hours!!! Friends for Atkinson Park and Pool needs our support!!! If your child would like to participate in the Atkinson Pool swim lessons please contact City of Windsor Parks and Recreation Dept for registration info or Friends for Atkinson Park(Marilyn -number listed above) for fee assistance information.